The Sherwin Anderson Skills Academy is a 501(c)(3) not for profit corporation. Since 2000, the Sherwin Anderson Skills Academy has helped young people achieve all they are capable of on the basketball court. We've also helped them become more confident individuals and better citizens off the court. 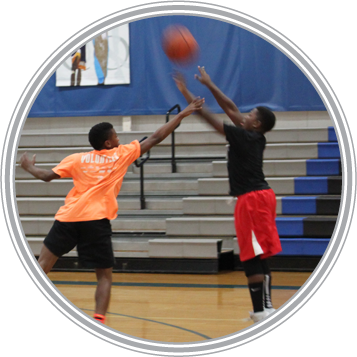 With all of the negative influences in today's culture, basketball provides an opportunity to have fun, learn important team skills, develop self-esteem in a positive environment, and discover the rewards of hard work and dedication. Every day we're helping young people achieve success through sports. But what makes the Academy different from most sports training is that we stress the importance of being great people in the community and achieving success in the classroom. Our program uses athletics to teach critical lessons about leadership, discipline, strong work ethic, responsibility, communication and respect. These lessons are central to the work we do at the Academy and are essential qualities that every young person can rely on throughout their life to be a better person, worker and citizen. THE ACADEMY STRESSES COMMUNITY INVOLVEMENT Athletics is an important part of a well-rounded life and we believe that volunteering in the community is an extension of the player's game, and encourages personal growth. Our student athletes have volunteered their time and energy at Ronald McDonald House, Habitat for Humanity, and an area soup kitchen. They've helped the homeless, and been involved in fundraisers to support other programs. Click here for more information about the Foundation, and how you can become a partner in our efforts.